Kim Pate was named as one of the “Women of Influence” by the Springfield Business Journal. She started coaching athletics before becoming an assistant athletic director. Pate was the first woman to be accepted as the athletic director at the University of Illinois Springfield in 2011. She sees the importance for a town like Springfield to have a connection to the university and their hometown sports team. Every student athlete must complete a minimum of 10 hours of community service. This partnership helps the university support the community, while the community becomes more engaged in the university and athletic events. Call 698-6000 to schedule your business portrait. View more business portraits on our website. Lisa Funderburg, attorney and mother of four, was named as one of the “Women of Influence” by the Springfield Business Journal. She is starting a new chapter in her life. After 25 years as the chief environmental health and safety counsel for Energizer Holdings, Inc., she is going into private practice and joining a firm. Her mother was her role model who taught her the value of community service. She volunteered at her kids schools and has served on the several Springfield boards. She believes that you can balance family and work to have it all at different points in your life. The greatest role of a parent is to help their children become contributors to society. 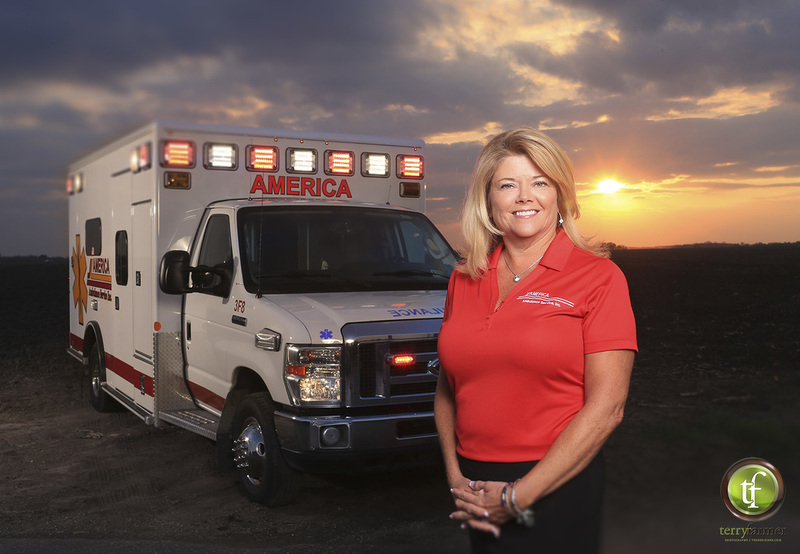 Susan Zappa, owner of America Ambulance Service, was named as one of the “Women of Influence” by the Springfield Business Journal. She credits the female role models of her mother, aunts, and grandmother for teaching her to work hard to be successful. When she started college, she majored in accounting but switched to nursing because she likes people more than she likes numbers. Today, her business has grown from one location to three locations in Springfield and Jacksonville. Her medics are undergoing training in critical care and will be the only ones offering this services. Congratulations Susan! Call 698-6000 to schedule your business portrait like Susan's. Go to our Business Portrait page to view business session prices. Kathryn Harris was named as one of the “Women of Influence” by the Springfield Business Journal. She is the first woman to serve as president of the Abraham Lincoln Association. Now she’s retired from the Abraham Lincoln Presidential Library, where she was the director of library services. A woman of influence who contributes to and helps make her community better. Had the great opportunity today to make a portrait of an inspiring person, Sonya Jones, from “The Biggest Loser”, and I had to do a selfie, to check the lights. Her hard work, determination, and winning attitude is a great role-model for students and the community. This years nominees of the Springfield Business Journal “Women of Influence” award are Lisa Funderburg, Kathryn Harris, Sonya Jones, Kim Pate, and Susan Zappa.